SWBAT use related facts to determine unknown numbers. What's missing? In this lesson students will learn to find the missing number in a given math sentence. I like to use this book because it demonstrates the many ways we subtract even in our daily lives. Symbols such as +, –, and = convey clear mathematical ideas. Each symbol has a precise meaning (MP6); when one symbol is used with another, such as 5 + 1 = 6, the combination of symbols conveys a more complex meaning than the individual symbols. Children generally build meaning for the basic operations in this order: through modeling (concrete), through pictorial representations (linking), and through abstract thinking (symbolic). Children often have the most difficulty with this last step. Before children can gain fluency with using symbols to communicate precise mathematical ideas, they must understand the relationship among the operations and among the different symbols. Demonstrate how to use addition to find the difference. Write 3 + ___ = 10 on the board. Children may ask how to figure out the missing number that completes the addition or subtraction sentence, the idea is to review the strategies of related facts, the commutative property of addition or using addition to check subtraction. Make sure that children understand that missing addends may be found using different methods, and encourage them to use the relationship between addition and subtraction to find the missing numbers. Once the students understand the concept of determining the unknown number, I hand out Missing numbers worksheet for them to complete. 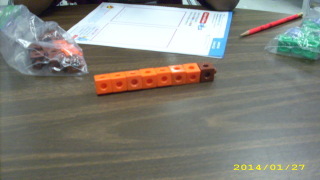 Here is a picture of a student using connecting cubes to help model their problem. Allowing students to use models to solve for missing numbers is important for first graders. For those struggling students, I write several addition problems on the board/chart paper with numbers missing from different positions in the sentence. For example, you might have some missing the sum, some missing the first addend, and some missing the second addend. Ask children to use connecting cubes to model the problems to discover the missing numbers. Have children write the related subtraction sentence that helps them find a missing addend. Children would use 6 red cubes and then add blue cubes to their cube train until they reach 10 cubes. This allows for a concrete model representation of the addition sentence, which allows for them to visualize how to solve the problem. 8 + ______ = 17 and 17 – 8 = ______.